"Well, I have yet to really eat good BBQ pork chops. I was tired of the three or four different baking methods and I decided to try something a bit different. If you are not into sweet, then this probably isn't the recipe for you. I would suggest squeezing a bit of lime juice over the meat in order to break up the sweetness. I have never paid attention to what type of pork chops I had either, I just grabbed and baked...but apparently it is all in the cut of the meat! I also froze a few heads of romaine lettuce for about an hour, divided it up into 8 portions, and added Parmesan cheese and dressing of choice.... MMMM!" In a large bowl, mix together 1 cup brown sugar, soy sauce, orange juice, brown mustard, honey, Worcestershire sauce, black pepper, and cumin until thoroughly combined and the sugar has dissolved. Place the pork chops into the marinade, and spoon marinade to cover the chops. Let stand at room temperature for 45 minutes to 1 hour. Remove the chops from the marinade, and discard marinade. Shake any excess drops of liquid from the chops, and grill until they are browned, no longer pink inside, and show good grill marks, about 8 minutes per side. Squeeze lime juice over the chops as they grill. An instant-read meat thermometer inserted into the thickest part of a chop should read at least 145 degrees F (63 degrees C). Melt butter in a large skillet over high heat, then stir in 1 tablespoon of brown sugar and cinnamon; bring the mixture to a boil, stirring to dissolve the sugar. Stir in the apple and pear slices, and cook, stirring often, until the fruit is coated with the butter mixture and softened but not mushy, about 5 minutes. Transfer the apple and pear slices to a grilling basket. Grill the fruit on the outdoor grill until the slices are browned, about 5 more minutes. 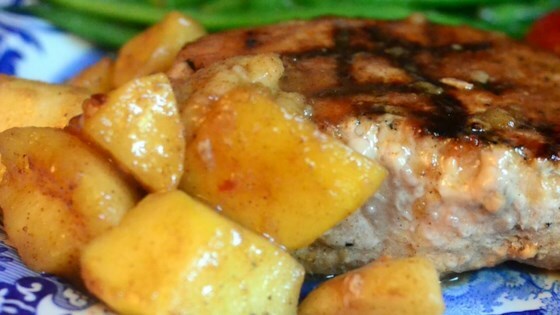 Serve grilled fruit with pork chops. This recipe was extraordinary! Definitely a keeper! It's a bit too cold to grill now, but we pan-fried and they were delicious! INCREDIBLE!!!! Everyone LOVED it!!! its a regular now in our house now. Thank You! Our fave porkchop recipe- the family loves it! We halved the amount of marinade as it's too much sugar for us. Great with a salad and rice. always a gem! added garlic to the mix and double the marinade. Great recipe!! Very flavourful and the kids love the toppings. This was great and easy to make, too. We had it with festival squash and green beans, then had Danny's Warm and Fuzzy Apple Cider afterwards! A delicious taste. The spicy ingredients blend beautifully with the sweet fruit. I cooked half on a grill and baked the other half.